Foodmantra: Why Do Indians Love Ragda Chaat? This is a North Indian vegetarian delicacy. Best eaten on its own or with a spicy potato patty. Dried White peas are also referred to as Safed matar or Vatana in some parts of India. I like to eat it with bread and lots of butter. A variety of Indian snack items are referred to as chaat, which includes samosas, aloo tikkis, paani puri, dahi badas and ragda patty. I am sure I have missed a couple in the rainbow of chaat items. These Chaat items are accompanied by lemon and fresh mint chutney, tamarind chutney and flavoured yogurt. 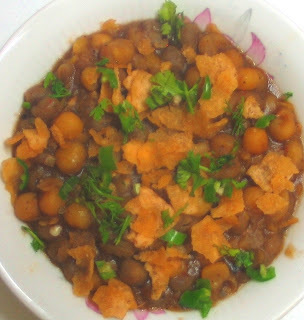 Why Do Indians Love Ragda Chaat? It is spicy, it is tangy with crisps sprinkled on top, need I say more? Well, you have to try this ragda to really know why. Soak the dried white peas five hours or overnight. Boil them in 2 ½ cups of water and some salt. You can pressure cook them for two whistles or in a deep pan on medium heat for thirty minutes covered with a lid. If you are using the processed canned white peas, you can use them directly. In a pan, heat the clarified butter (Ghee), add in cumin and asafoetida. Once the cumin turns a shade darker in colour, add in the grated ginger and stir. Drain out the excess water from the boiled white peas and add in the peas and stir. Save the cooking liquid to use it later. Add in salt, coriander powder, red chilli powder and stir. Add in ½ cup of the cooking liquid. Cook on medium heat for three to five minutes. Now, add in garam masala powder and dried mango powder and stir. Add in a little cooking liquid if the white peas seem too dry. Simmer for two minutes, stir and turn off the heat. Garnish with crushed puris or papdis with green Chilli and coriander leaves. Squeeze a wedge of lemon on top. Serve Hot.